With a healthy 3-point bonus on travel purchases and a 1.5-point bonus on everything else, this no-annual-fee travel card gives business cardholders ample opportunity to stockpile a large number of points just by using their card for everyday business expenses. If you spend a lot on business travel, but don’t want to invest in an annual fee travel card, the Business Advantage Travel Rewards Mastercard from Bank of America is a good alternative. 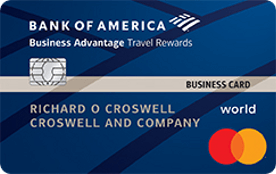 This surprisingly generous travel card offers a solid three-point bonus on every dollar you spend on travel as long as you book your business trips through Bank of America’s travel center. Many cards that offer comparable travel bonuses, by contrast, typically charge annual fees as high as $95 or more. Unlike many travel cards, the Business Advantage Travel Rewards Mastercard also provides cardholders with ample opportunity to stock up on rewards points just by using the card for everyday expenses. The Business Advantage Travel Rewards Mastercard offers a substantial bonus on travel purchases, making it a good pick for companies that spend a sizable amount on airfare, hotel stays and other travel expenses. You get three points for every dollar you spend through Bank of America’s travel center. So if your company typically spends around $10,000 a year on business travel, it will collect at least $300 worth of points. If you regularly send your employees off on business trips and have them use their company cards, you could potentially collect significantly more – especially since the card doesn’t limit your yearly earnings. The Business Advantage Travel Rewards Mastercard offers 1.5 points for every dollar on all other purchases, including common business expenses that don’t typically earn a rewards bonus, such as office supplies, shipping expenses, utilities and more. The flat rewards rate not only makes it easier for your business to earn a large amount just by going about your usual day; it also takes the hassle out of rewards programs since you don’t have to keep track of a handful of bonus categories. There’s no cap on the total amount you can earn either, so if your company uses the Business Advantage Travel Rewards card for most purchases, you could potentially collect a huge number of points that can later be converted into free travel. For example, if your company typically charges around $6,000 a month on a wide range of expenses, you’ll collect more than $1,000 in free travel by the end of the year. Many cards, by contrast, only offer bonuses on a small fraction of expenses. This card doesn’t offer very many ancillary travel benefits, though, so if you’re looking for additional perks, such as airport lounge access, fee credits or priority boarding, you’re better off investing in an annual fee card. You won’t get upgraded insurance benefits, such as delayed baggage insurance, nor will you get other appealing freebies that are widely available on premium cards, such as free WiFi, complimentary room upgrades and other hotel privileges. You will be able to use this card freely abroad, though, and use it to make international purchases online without incurring extra charges. Like most travel cards, the Business Advantage Travel Rewards card doesn’t charge a foreign transaction fee. In addition to a generous rewards program, the Business Advantage Travel card also offers a pretty good sign-up bonus for a card with no annual fee. Cardholders are awarded 25,000 bonus points if they spend $1,000 in the first 60 days, worth around $250 in free travel. Many no-annual-fee competitors, by contrast, offer just $200 worth of bonuses. The biggest downside to the Business Advantage Travel card is its rigid redemption policy, which doesn’t allow you to transfer your points to other programs. Many travel card competitors let you transfer points to a wide range of frequent flier and hotel loyalty programs. For cardholders who travel often, that’s a big perk – especially since it gives you more flexibility with your travel choices and more buying power overall. Bank of America also limits the amount of value you can get out of your travel points by requiring you to go through the issuer’s travel booking program to book rewards-funded flights. That negatively affects the value of the card’s travel rewards program: By booking all your travel through Bank of America, you may be missing out on cheaper reservations that are only available on other sites. That said, Bank of America’s travel center is powered by the well-known discount website, Expedia, so you’ll likely find some pretty good deals. Why get the Business Advantage Travel Rewards Mastercard? You spend a fair amount on travel, but don’t want to invest in an annual fee credit card. You want to earn a larger bonus on everyday business expenses. You don’t want to mess with a complicated rewards program. You prefer points instead of cash. To maximize your rewards spending, use your card for all or most of your travel and business expenses. Book your travel through Bank of America to earn a three-point bonus on every dollar you spend. Charge at least $1,000 in the card’s first 60 days to capture a sign-up bonus. Turbocharge your earnings by distributing free cards to employees and asking them to charge company expenses.